New construction roofing is a specialty of ours. The way we see it- you have a blank slate and an opportunity to really make your home stand out. We can help you choose the best roof for style and protection. We take special care on new construction roofing projects because we understand that it’s an opportunity to invest in the aesthetics and protection of your new house. 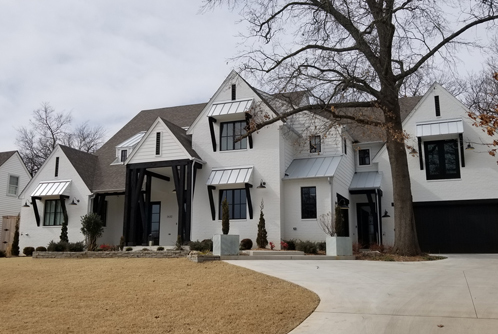 Over the last 25 years, C & S Roofing has successfully completed new roof construction, roof replacements, and roof repair projects in Tulsa. We have the experience and knowledge to help you choose the best roof for your house. You can have confidence that your new investment has the best protection available. When choosing a service provider for roof installation, you need to consider factors such as warranty and pricing, alongside quality. At C & S Roofing, we ensure that you get a reliable roof system that meets your desired specifications. We do this in a transparent manner, providing you with a detailed contract, the best materials, and warranty, all at a competitive price. When comparing roof installation prices of different companies, you should remember that the cheapest contractor isn’t necessarily the best. Many roof installation companies cut corners to make services available at very cheap pricing. At C & S Roofing, we don’t compromise on quality. Every roof installation project undertaken by us is guaranteed to meet industry standards and last long-term. All roofs installed by C & S Roofing are guaranteed five years’ warranty, covering workmanship flaws and other such defects. Considering adding a new roof to your home? Work with a roof installation contractor in Tulsa that cares about your needs and works towards them. With over 25 years of experience installing roofs in Tulsa, C & S Roofing has built a base of happy customers. If you have a roof construction or installation job, contact us for a quote today. You can reach us at 918-438-4442 between Monday and Friday, 8am-5pm. I have owned homes for over 40 years and have had several occasions to purchase a new roof. It was such a pleasure to find C&S Roofing. They are always priced right, work easily with insurance adjusters and have done the best quality job by far. I have also had occasion to refer them for other residential and commercial jobs. The best testament that I can possibly give for them is every referral has resulted in, "thank you! I will never use anyone else for roofing again."